When you come visit us in South Africa, the sights of wildlife will stay with you as fond memories forever. Here’s a field guide of well-known buck to get you prepared. 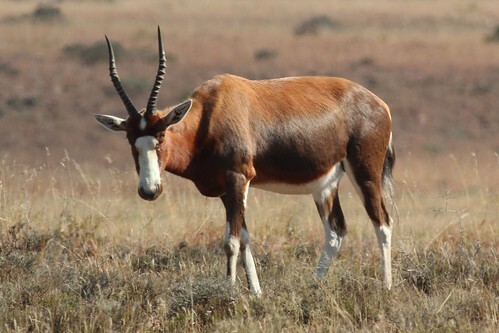 Antelope species are found all over the world, however this buck is endemic to South Africa. The blesbok prefers open grasslands and will not be found in wooded areas, making it an easy buck to spot. Male and female blesbok are similar in appearance, with both sexes possessing horns reaching up to 38 cm. They differ from other antelopes with a flash of white on the face while their bodies are dark brown fading into black with white legs. The word bles comes from the Afrikaans word for “blaze,” referencing their forehead. South Africa is home to two different species of this medium-sized buck, namely the black-faced and the common impala. At present, the former is listed as Vulnerable on the International Union for Conservation of Nature (IUCN). The coat of the impala is a glossy, russet colour and the males possess lyre-shaped horns more slender than bigger buck. Impala can be found in Southern Africa, up to Rwanda. They are well-known for their speed and agility, capable of jumping up to 3m high. There are two types of kudu, the greater and the lesser kudu. The English name is from the isiXhosa, iqhude and the Afrikaans, koedoe. These buck are generally peaceful and prefer to be separated into male and female groups. The males will, however, challenge each other when the time comes, with the males exerting dominance by making their hair stand on end and lock horns. Kudus are excellent kickers and can break enemies’ necks. Like impala, they are adept at jumping. The kudu horn is famous for its shape, inspiring the vuvuzela. Kudus are recognised by their dark coats, shaggy mane, large twisted horns and thin white stripes. Diet: leaves and shoots or fruit in the dry season. The most world-recognised of South Africa buck (thanks, rugby), the springbok is known for its incredible speed and jumping ability (4 m). The name comes from the Dutch word for “jump.” The springbok colour ranges from tan to white and chocolate brown. Both sexes have horns, although the female horns are slimmer. The springbok can be found all over Southern Africa in grasslands, savannah, bushveld and desert. Springbok often “pronk,” showing off by springing high up off the ground and flapping their tail to give off sweat, marking their territory and establishing dominance. The gemsbok or oryx, is a large antelope native to desert regions of Southern Africa, particularly the Kalahari. The oryx is pictured on the Namibia coat of arms. Gemsbok are light brown and grey with lighter patches towards their rump while their tails are long and dark and they have notable white “socks.” The gemsbok is similar to the blesbok in taut, strong muscles and legs and both genders have long horns. They are the largest species in the oryx genus. Find out more from Rovos Hunting Safari to book your own luxury game experience around Southern Africa.